If you are serious about joining the leader in kitchen exhaust cleaning services, and learning a service trade and business methods that are internationally recognized (ISO 9001:2008), then we would like to hear from you. We offer one the few services that is required by law and every commercial kitchen is a potential customer! Plus, we do not sell "hundreds of franchises" like some are attempting. Our exclusive territories are large enough for you to grow a thriving business. We succeed by keeping our customers satisfied and supporting our franchisees with training, tools and innovative methods. This is a rare opportunity to become part of national service trade business with 41 years of success and well established relationships. 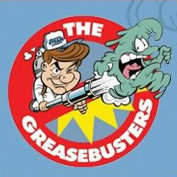 If you are quality focused, service-oriented, and want to capitalize on a great opportunity, then contact us about becoming a GreaseBuster. Patented bio-degradable industrial degreaser "GreaseBeast"
In Demand, Required by Law: Our service is required by every restaurant and commercial kitchen nationwide on a regular frequency (NFPA and local regulatory authorities). We operate in a very large and stable market with approximately 930,000 eating establishments in the U.S! In addition to servicing restaurants, we service country clubs, nursing homes, hotels, motels, hospitals, sports parks, cafeterias, military bases, airports – wherever a meal is prepared away from home. We outperform our competitors; our ISO 9001:2008 quality registered method is simply the best. No Royalties: You will never pay franchise fees or royalties. It's your business, and your profits. Quick-start program: You can be up running your business within weeks, including management training and crew certification/training at our HQ in Washington D.C.
Turnkey package: We supply you with everything you need to succeed including equipment, supplies, training, toll-free support, marketing, methods, tools. Training & Support: You get our complete backing & support as a national leader in kitchen exhaust cleaning. It's simple – when YOU succeed WE succeed. Our toll-free support and dedicated corporate team are with you for the life of your business – at no additional cost. Equally significant is our exclusive network of GreaseBusters! owners. Is it wise for me to go into a business that I know very little about? Most of our owners have had no previous Kitchen Exhaust Service or Fire Safety experience. Our extensive training program is designed to teach you all facets of the business and give you a step-by-step operating plan. In addition, our technician certification and training program is available for all of your service crews throughout the entire life of your business at no additional cost. The most important prerequisite is a firm commitment to follow our proven program and desire to provide your customers with outstanding service. As with an service business, you should enjoy interacting with customers and solving problems. ISC has a marketing and advertising program. All local accounts and contacts within an owner territory will be made available to the owner to pursue these accounts. In addition, ISC has a direct mail program, online marketing, social media, and other marketing materials that will be made available to all ownerships. What does the Ownership fee cover? It secures the right to own and operate an Industrial Steam Cleaning ownership territory, the use of ISC's trade names, trademarks, chemicals, training center and manner of doing business. It also includes a full start-up package including chemical, plastic, steam cleaning equipment and training. Click on Request Information for FREE info on how to open a Industrial Steam Cleaning franchise today! Please Note: This Industrial Steam Cleaning franchise opportunity and other franchise business opportunities, businesses and franchises for sale on this web site are not to be considered as an "offering", "franchise offering", suggestion or recommendation by Franchise Leader™. This advertisement depends entirely on the truthfulness of the information provided by our advertisers which includes, but is not limited to, franchisers, franchise brokers, franchise consultants and business brokers. Franchise Leader™ recommends that you consult a lawyer, financial consultant, accountant or professional advisor before buying a franchise or business opportunity or any type of business. By using this form or any part of our website, you have agreed to all terms and conditions of Franchise Leader™. Please review our Terms & Conditions for more information.